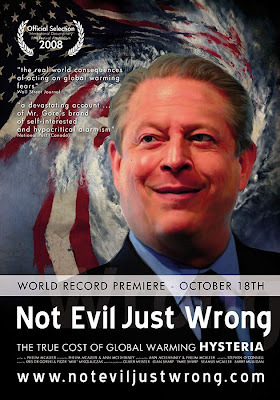 Articles Tagged "Not Evil Just Wrong"
A national campaign was launched today to get public schools that have shown Al Gore's "An Inconvenient Truth" to give equal time to the opposing view of global warming. The Independent Women's Forum launched its Balanced Education for Everyone campaign today. It hopes to have the 2009 documentary "Not Evil, Just Wrong" shown in classrooms around the country. "Not Evil, Just Wrong" claims to expose erroneous claims about global warming. The Independent Women's Forum is a nonprofit, founded in 1992, that supports limited government and free markets. Ryan Alexander, the campaign manager for Balanced Education for Everyone, said many schools around the country are offering the Al Gore movie as an education on the global climate. A POLITICAL row has broken out over a Derby Conservative councillor's decision to show a climate change-sceptic film in the city's council chamber. The new film, Not Evil Just Wrong, is a documentary which suggests evidence of global warming is inconclusive and that the impact climate change laws will have on industry is much more harmful to humans than beneficial. It is a direct challenge to Al Gore's film, An Inconvenient Truth, with was shown to councillors in Derby during Labour's control of the authority in 2007. Tory councillor Frank Leeming put forward the idea to show the new film today, sparking criticism from Labour councillors. Labour group leader Chris Williamson said: "I am totally appalled. The council is committed to reducing carbon emissions, yet the Conservatives are pushing a film which threatens all of that. "It reaffirms our belief that the Conservatives have merely been paying lip service to environmental issues in pushing their new branding as a caring party."